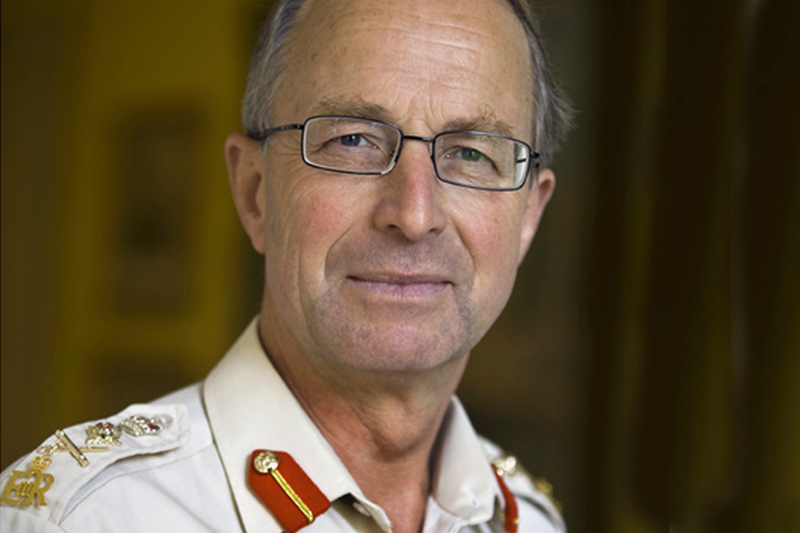 Speech by General Sir David Richards, Chief of Defence Staff. It is a great privilege to be here delivering the fifth of the Cramphorn lectures. It is a particular pleasure that Mrs Cramphorn is here. Chief Constable Cramphorn was a leader in cross community relations, both in Northern Ireland with the PSNI and later in Yorkshire particularly at the time of the 7/7 bombings. Having had Peter Clarke, Ian Blair, Charles Farr and David Petraeus appear here before me I am honoured to be following such distinguished company. The words “no pressure then” spring to mind! Over the past month I have been getting to grips with my new appointment as Chief of the Defence Staff. Whilst I do not have time to ponder it too much, I am genuinely still somewhat baffled how I have ended up in this position. The 18 year old boy who joined 29 Commando Regiment to follow his brother would not recognise the rather care-worn man who stands before you, and would have quailed at the thought of high rank dismissing it without doubt as ridiculous anyway. The job will not be simple, but it will be made easier by the fact that I know I will be supported by some of the most capable, dedicated and selfless soldiers, sailors, airmen and marines that this country has ever produced. And by the civilians in the MOD who have again and again demonstrated their skills and commitment. I am not going to dwell on people in this talk other than to say that if we fail to attract and retain the very high quality people that historically join the British armed forces, our prospects for the future will diminish markedly. They lie at the heart of military capability. I am not certain the consequences of failing in this are always fully appreciated. People tend to focus more on the kit and metal than the people. Over the next decade we will need every ounce of their dedication because the issues that we, in defence as a whole, have to address are diverse and challenging. And, as was the case with every one of my predecessors, I recognise that the outcome of our efforts must meet the very real challenges confronting us. It is vital for the future security of our nation. I speak at a time when all 3 services are heavily committed to operations. In Afghanistan, off the Horn of Africa, in the Gulf and in the Falkland Islands, to name a few prominent examples, the Navy, Army and Air Force are together ensuring the UK’s interests are defended. They and the civilians who work alongside them across the Ministry of Defence, and indeed on operations themselves, have rarely been pushed so hard. Current commitments demand our endurance and test our resolve. But I have no doubt that with the support of the people of this country, support not only for who we are but for what we do, the armed forces will meet every challenge thrown at us. I am confident that they will not let you down. First, the National security strategy which is the guiding document for our analysis. It set the strategic context for and then shaped the Strategic defence and security review, as it will the follow-on work. It is, in military speak, our Commander’s intent. Secondly, the review itself; the options we had, the choices we made and the military judgments that lay behind them. As with any outcome that is properly strategic in its approach, our military judgments are matched to the resource it is deemed the country can afford. This has required the difficult decisions we have taken to be a reasoned balance of acceptable risks. And third is Afghanistan; the last in this list but the absolute priority of the National Security Council and the armed forces. The Defence Secretary reiterated in parliament this month that it is our main effort. And as I have said in the past, our actions in Afghanistan are vital for the short and long term national security of our country. The consequences of the choices made there will reverberate for many years to come, on international security and stability but also on the ability of Britain to exert influence worldwide. When the government announced it was calling a strategic defence and security review it expanded the remit of traditional defence reviews. Linking wider security to defence and preceding it with a proper strategic outlook has pulled together themes that have too often, and detrimentally, been considered separately. Based on the National security strategy, the SDSR has set us on the path to reform the nation’s defence. It has embedded importantly the experience of a decade on operations into a plan for the future. To understand this you must see the SDSR not as an end state but as part of a process. It is not the final word but a stage in the evolving role of our armed forces. It is a waypoint to guide the first stage of transformation. As part of this the SDSR recognises the change in a generation of servicemen and women. Officers who were company commanders in Northern Ireland at the time of the last defence review in 1998 are now generals with many tours of Iraq and Afghanistan under their belt. Airmen who joined for adventure are now flight sergeants with hours of combat missions, and experience of leadership in the most trying conditions. Since that last Review in 1998 the UK armed forces have undertaken over a hundred operations and paid a heavy price. More than 560 of our comrades-in-arms have been killed. These operations have seen new equipment, new people and new doctrine all play their part in the changing character of conflict and have moulded the forces that we now seek to transform. And they have challenged the way we do things. As the historian Corelli Barnett put it: War is the auditor of institutions. The effectiveness of the system of urgent operational requirements for procurement is, for instance, but one good thing that we need to embed into our wider processes. As our experience has grown, so our understanding of modern conflict has grown. For the military in particular these changes have been marked by a coming together of types of conflict. Wars today have begun to look increasingly similar, whether they are fought by states or non-state actors, by armies, militias or rebel groups. So change is ever present in the military field. But the National Security Strategy and the SDSR have given us the opportunity to place that change in its proper strategic context, helping to ensure that transformation is objectively directed rather than simply imposed by events. The government’s pledge to hold regular reviews recognises this continuing evolution. I am reminded of Churchill’s words: To improve is to change; to be perfect is to change often. The time it takes to build a ship or to train an army or an air force means it is right that the security posture we require is kept under permanent review. And the government’s pledge does just that. But the SDSR does not stand alone. It must be seen in the context of the threats facing our country, and the national finances. The decisions taken in the SDSR have rightly been taken on the basis of the excellent analysis done by the National Security Strategy which looks beyond the immediate five years at the range of risks the nation faces. The National Security Strategy has not been given as much prominence as the SDSR and it should be given more. It is an impressive piece of work by a mixed team of officials, both civilian and military, from several departments. The NSS shapes the debate, identifies the issues and gives us the direction of travel. It points to the themes that rightly sit at the heart of our national security. Not just Afghanistan or the threat of nuclear proliferation but also less recognised issues. Advances in biological science, climate change and social and demographic change are taken into account. I am reminded of last week’s report to the US Congress that, for a time, some 15 percent of the world’s internet traffic was diverted through Chinese servers. This changes what we mean by “supply lines” or “global commons”. The UK’s trade is now so dominated by financial services that the internet is as vital to us today as shipping routes were a century ago. They range from international terrorism, nuclear proliferation, sabotage, espionage, dissident Northern Ireland groups, through natural hazards and cyber attack to the economic situation. Given this complex under-pinning, the strategic context if you will, the choices we make must accommodate a wide spectrum of threats. That is why our so called adaptable posture is the right one. And finance is clearly part of the strategic context. He is, of course, right. The financial security of the nation must be a primary consideration of any review. If you need an example of a government failing to get this formula right, pause to recall the fate of the Soviet Union. Moscow’s attempt to match US defence spending contributed to a bankrupt state which led to its collapse. A plan is not a plan if it doesn’t take into account the resources available. It is a wish list and no general worth his salt bases his plan on wishful thinking. This SDSR has been no different and builds on the reality of the position in which we find ourselves. That of course has required us to make judgements that trade the perfect for the acceptable. The Review prioritises on the basis of our assessment of risk. It ensures we never fall into the trap of gambling. We have done so under strategic direction that recognises the changing character of conflict and the threats we face, now and in the future. It charts a path of longer-term transformation. What was absolutely necessary to have in one’s armoury even 10 years ago, may well not be so vital in the future. Understanding this dynamic is absolutely essential. It was Liddel-Hart who remarked that there is only one thing more difficult than getting a new idea into the military mind and that is getting an old idea out! And secondly the decision to decommission the Harrier fleet and retain the Tornados. The case for carriers was not supported by everyone. Some argued that they were no longer necessary; that the range of modern jets, extended by a fleet of tanker aircraft, and our basing agreements mean they are part of yesterday’s arsenal. Whilst I consider it an acceptable risk be without carrier strike for the next decade, I do not think, and did not during the SDSR debate it prudent to assume a future that discounts ever requiring them again. But it is worth being clear. The gap in carrier based aircraft does not diminish our ability to defend the Falkland Islands. The situation in the South Atlantic is very different to that of 1982. Furthermore the government in Buenos Aires is now a democracy, not a military dictatorship, based on the rule of law and tied into a network of alliances, both regional and international. The Argentine foreign minister emphasised in an interview this month that they would seek to take the islands through peaceful means. Once all this was understood and agreed, and given that our finances required us to remove a complete fast jet type, the issue of whither Harrier or Tornado could be based on current and anticipated operational need. In this, the choice was made for us some time ago. When the decision was taken in 2009 to reduce the Harrier fleet to 32 aircraft it became impossible to sustain operations in Afghanistan, and maintain an adequate contingent capability for the unexpected, with just the Harrier. Of course the world will not stand still. The short delay to the first carrier, to allow it to be fitted with ‘cats and traps’, means that when it comes into service in 2019 it will be equipped with the hugely capable carrier variant of Joint Strike Fighter. That will mean we will have greater flexibility over their 50 years lifespan and will ensure we are prepared for a less predictable future. For other types of equipment similar decisions have had to be taken: numbers of tanks and artillery will be cut, numbers of people reduced and ships paid off. To be clear, that does not mean that equipment that was once the backbone of our navy, army, and air force is now useless. It is all a question of scale and context. And because we have prioritised against identified risks but not foregone any major capability, we retain the flexibility to evolve and grow back that which a changing strategic environment suggests wise in the future. We must not structure so much for hybrid warfare that an enemy’s asymmetric advantage could become it’s possession of conventional weapons. I do not think this is a major risk but it is one to monitor. Anyway, we need to retain such equipment for today’s threats. Fighter aircraft are used to protect the skies over Britain. Tanks have been deployed in counter-insurgency operations not just by the UK in Iraq but by ISAF in Afghanistan and by the Pakistanis, in considerable numbers and most successfully, in the FATA. The Americans are deploying tanks to Helmand now. Reflecting a different but very real threat, the SDSR also mandates the formation of a UK Defence Cyber Operations Group. The detailed structure of the group has yet to be determined, but it will be a fundamental part of our strategic operations, and will be able to plug into other security organisations outside defence. Some of you will also have heard me talk about the importance, in this fast moving digital age, of information as a part of conflict. In some respects a weapon in its own right. Reflecting this in our organisation, training and tactics is our next task. This leads me nicely on to Afghanistan, a war in which information and influence is central to success. Today in Helmand, the UK and the US have achieved what few expected even two years ago. Governor Mangal of Helmand, with whom I met only a few weeks ago, told me how he drove everywhere and expected his staff to do the same. When I commanded in Afghanistan that would have been unimaginable. The right force levels have delivered what we knew was possible but seemed unattainable. As agreed at the Nato conference in Lisbon, the ANSF will take the lead on security from the end of 2014. This is why, as the Prime Minister said, British troops will not be on combat operations from 2015 although, and I quote, “it may be in our interests to make a decent sized contribution … to go on training their armed forces”. 2015 in my judgement is an achievable deadline and a realistic ambition. But as David Cameron has already stated, I anticipate our relationship with Afghanistan continuing for many years to come and we will stay the course with our Afghan and Pakistani allies. For the UK to leave without an enduring relationship with the Afghan people would be a mistake but let me be clear what I mean by that. With India and Pakistan, nations with whom we have a history longer and in some ways more fraught than with Kabul, we now have enduring partnerships as equals. Diplomatic, development and defence agreements underpin our relations and we look forward to deepening them over the years. Prioritising these, as well as our interactions with the rest of the world more generally, will be part of our development of grand strategy, work in which I look forward to supporting the government and the National Security Council in particular. Getting it right will transform the Ministry of Defence and enable us properly to fulfil our mandated role as the UK’s strategic military headquarters, in support of government policy. But that is something I will address on another occasion. The National security strategy has provided us with the strategic context for subsequent decisions. It is our commander’s intent from which we can derive a national grand strategy that links ends, ways and means in the traditional, but for a while now somewhat neglected, manner. The Strategic defence and security review is the first part of this rolling process. It takes into account the financial and global situation in which we find ourselves and makes calculated judgments that balance risks against resource. We cannot prepare for everything. We cannot be instantly ready for every eventuality. But we can be prepared, in close concert with allies, for the most likely contingencies and structured and equipped to deal with the greatest threats. We must prioritise for today’s operations. It is no good being ready for tomorrow if that risks losing today. All this is balanced to ensure we can fulfil our standing commitments to the people of the United Kingdom in guaranteeing the protection of our air and sea space and to the people of the Falkland Islands for whom we fought so hard thirty years ago. Equally we take very seriously our obligations to allies and partners whom we are committed to support. But the armed forces do not do this alone. As one of my successors as Commander ISAF, Gen McChrystal put it: “it’s an axiom in the Army that soldiers write the checks but families pay the bills”. So I say that if you find me here today humbled by the responsibility I hold but confident about the future, it is because I stand on the shoulders of giants, supported by the families of the nation they serve with such distinction.